Huawei announced today its next generation chipset - the Kirin 920. It is based on ARM's big.LITTLE architecture and uses four Cortex-A15 and four Cortex-A7 cores capable of working simultaneously. The Cortex-A15 cores can be clocked from 1.7GHz up to 2.0GHz, while the energy-efficient Cortex-A7 ones start at 1.3GHz and can be boosted up to 1.6GHz. The Kirin 920 relies on the powerful Mali-T628MP4 quad-core graphics. We've seen the same GPU, but with six cores (MP6), to perform in the octa-core models of the Galaxy Note 3 and Galaxy S5. Another key features of the new chipset are the LTE Category 6 support, Tensilica HIFI3 professional audio processor, 4K video recording and QHD display support. The first device expected to utilize the Kirin 920 is the leaked Huawei codenamed Mulan flagship with a 1080p display, 3GB of RAM and a 13MP snapper with 4K video recording. 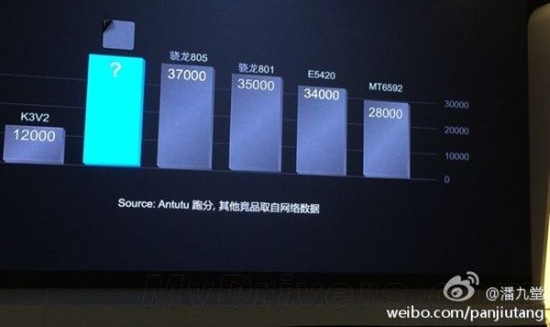 Its benchmark scores appeared yesterday, suggesting that there is some truth to the Huawei words. The smartphone outperformed each and every other flagship in AnTuTu, although the margin is hardly so comfortable as to suggest the Snapdragon 805 is also within reach. Then again, the Mulan is still in its beta stages so the score might improve even further. Hopefully things turn out better this time, unlike the highly uninspiring Kirin 910T running inside the Huawei Ascend P7. Lol no wrong. UHD = 4K = almost 2160 horizontal pixels. QHD = quad HD = 4*HD = 4*720p = 1440 Horizontal pixels. Since 2160 =/= 1440 it's fairly obvious they're completely different.